Please take your seats and be silent. 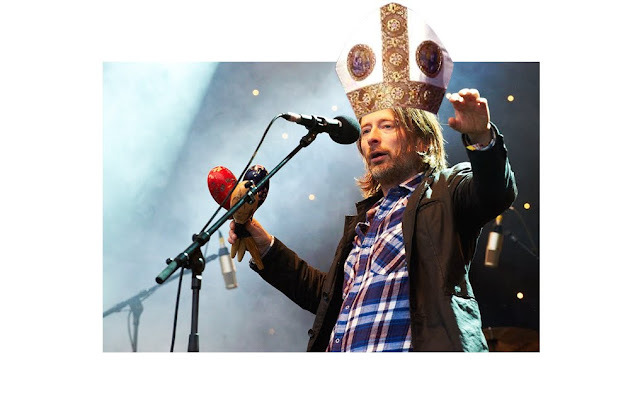 The Church of Radiohead is now in session. This is my second article of six exploring "liturgical" worship and whether or not it works in my culture, that is "middle American Christianity". Our foundational question is: Is the liturgy too elitist and academic for "regular" or mainstream Christians who fall into the general Evangelical, Pentecostal, or Protestant camps? Here is a link to the first article. Before I move on to more specific reasons why I believe the liturgy "doesn't work" in my cultural context I will now attempt to further understand my situation through something of a parable. Imagine that for some reason I decided to move back to my home town of Peoria, Illinois in order to introduce everyone there to the band Radiohead. Lets say that for some reason NO ONE there listens to them, at least among the people I grew up with. Sure, there were some people listening to Radiohead when I was younger, but these were some strange folks with "out there" tastes in music, nothing like me and the pop radio-loving kids in my circle of friends. Also imagine that I too am a musician and songwriter and have the hopes of getting my music heard and becoming an established artist in Peoria. I have high hopes in moving back. I want to introduce my city to a band that I love as well as to my own music that I've been hard at work on for a number of years. Becoming a Radiohead evangelist was no accident. They are landmark band to anyone who knows anything about music of the last 20 years. They redefined what a "rock" band can and should sound like. They exploded our conceptions of popular music, opening up our minds to new and strange worlds of sound. They made weird normal. To someone like me, Radiohead is a band that everyone should know about and come to own at least an album or two of. And so my goal is to get as many people in Peoria to love their music as possible. However, after moving back I soon come to realize all people want to listen to are either the "classic" pop/rock/country hits of past decades or the synthesizer/dance hits popular today. There simply seems to be no room in their listening tastes for a boundary pushing electronic tinged rock band. It is like Radiohead has certain elements of music that everyone likes, but they are all the wrong elements for the people in my city. Similarly, when I find myself performing gigs around the city all people want are classic rock and pop country cover bands. They certainly don't want introspective singer-songwriter ballads or Radiohead cover songs. I moved back to Peoria under the assumption that people would be hungry for the music of Radiohead and original singer-songwriters such as myself. I thought "This is something they'll latch onto as soon as they find out about it. This is the music that will come to define them—they just don't know about it yet!" I had no intention of introducing them to "difficult" art-rock, or to music that was off-putting for being either too abstract, too political, or too dissonant. Sure, Radiohead's music is challenging, but they have so many amazing songs surely people will be able to look past any "difficulty" for the pure enjoyment of the songs themselves. I actually and truly thought the people I knew (and loved!) would like this music with their heart, soul, mind, and strength. But no, I made a faulty assumption. There was no built-in market for the kind of "music" I loved the most, the kind of "music" I thought people would be drawn to if they only knew about it. To be sure, Radiohead is one of the most renowned and beloved bands of the last 20 years, and yet, for many they remain that "weird band" only music snobs like. They are a band for elitists. I moved back home hoping to share something I passionately loved but instead ended up being the off-putting snob that no one understands. I wanted to open up people to new musical worlds, to gather them around some of the greatest music I've ever heard and yet I still find myself (mostly) alone. I realize now my approach was condescending. I assumed the people of Peoria didn't already have music they loved, music that was meaningful to them, music that changed their lives. To me the music of Radiohead was accessible to all (especially since it costs the same as any other music) and yet the response I received was as if I've opened a high end restaurant with eclectic food choices and exorbitant prices accessible to only a few. Now, after realizing I was somewhat insulting and after many seasons of trying to "turn people on" to my band and my music, I've mostly given up on the proselytizing. Sure, it's still about all I listen to and I'm still writing my own music, but I don't push it on anybody anymore. I kind of assume it's not for them and I mostly stick to myself in my small social circle where we know Radiohead is the best band of our generation, though we don't talk like that to those on the outside. I feel a lot of tension (and sadness) in my parable, for to those of us who have been taught about "liturgical worship" we know it is undyingly, passionately accessible to all. It is the epitome of "public domain", a way of worshipping God that anyone and everyone should incorporate into their lives as disciples of Jesus. My assumption was that it would be instantly palatable to the "general public" of Christians, but instead people seem to treat the liturgy like a high end restaurant. "Oh no," they say, "that's not for me...I don't go to that kind of church..." And then they begin to offer their list(s) as to why exactly a "liturgical" church is not for them. Chris, this is Peoria, right? Is it possible that there are already sufficient Catholic, Anglican, Lutheran, and Orthodox churches? I'm not sure what it would take to convert protestants and pentecostals to Christianity, but that's essentially what you need to do.